Fostering impactful relationships that are productive and supportive is a crucial part of overcoming common team challenges. At the heart of most workplace problems lay foundational interpersonal components that impact all team interactions. Clashing motivators such as individual competition vs. teamwork, social service vs. reward, etc. Nurtured success, or out of control chaos? The people complexities in teams can go many different ways, allowing for many different real-world outcomes that can make and break success. How and when we address the organization can be the difference between an energizing uplift in team morale, before conflict resolution is required, and an entire operation at risk. One of the best ways to drive team success and bridge personality differences is through a team building session that harnesses the insights and analytics from a robust personality assessment. This method can improve communication, develop loyalty, increase camaraderie, and enhance an organization's performance. 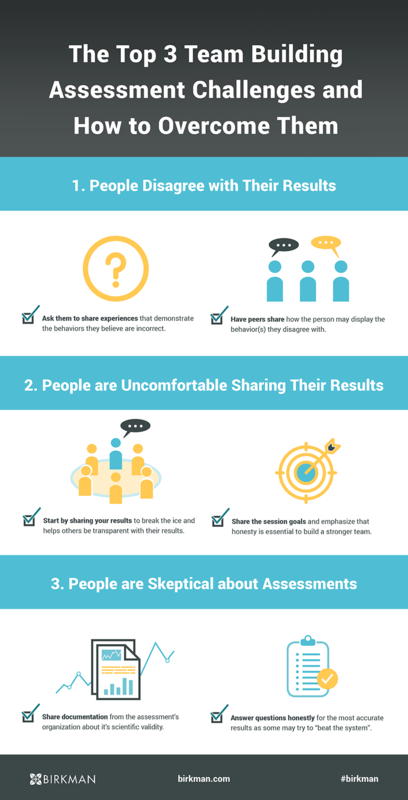 While a scientifically validated personality assessment is a powerful tool to clarify and strengthen team dynamics, some team members may find it hard to trust these instruments. Even if people do trust in the reliability of a personality assessment, they may not see its effectiveness in the workplace (a perfect example is now advanced Birkman practitioner, Aaron Dawson, who discovered the power of personality at work). It is not uncommon to encounter hesitation to using a personality assessment in a professional setting. If you are looking to implement a personality assessment into your next team building session, it's important to be aware of what other logistical and conceptual puzzle pieces you'll need to put in place to get the most out of your investment.You may want to download our free guide to ensure that you have a well-rounded understanding of the impact that personality assessments can have on the development and optimization of your team members.